TTClean automates your system cleanup and maintenance. TTClean installs into <root drive>:ttbin and uses a file called ttclean.ini to determine the specific set of tasks that it performs. For information on ttclean.ini, refer to ttclean.ini. By default, the TT Gateway installs with TTClean configured to retain the ten most recent log files of a particular type. TTClean is set to purge all older log files. For a list of files that TTClean does not touch, refer to Ignored File Extensions. Additionally, you can use command line parameters to determine whether TTClean generates a log file or outputs verbose command window feedback. TTClean's log file is saved to <root drive>:ttlogfiles and named: TTCleanLog-DT_HHMMSS.log, where DT consists of the two-digit month, two-digit day, and the last two digits of the year. By default, TTClean uses the -b option. If you use a TTClean section in ttchron.ini, you can include these command line parameters in the args parameter. Sets TTClean to not provide output in the Command Window nor does it create a TTClean log file. Provides brief (basic) output in the Command Window and log file. The output includes the name of the command and any error messages. Provides verbose feedback in the Command Window and log file. The output includes the name of the command, the names of any files affected by the command, and any error messages. Provides command line help and information in the command window. You can run TTClean without using a Command Window by double-clicking the TTClean.exe file. To install TTClean on a non-TT Gateway (i.e. a MISS Device), you must create the directory <root drive>:TTClean and then copy TTClean.exe and the ttclean.ini file into this directory. Include the absolute path and filename of the TTClean application in your command line. Issue the TTClean command from the directory that contains the TTClean.exe file. Add the absolute path (without the filename) to the Path System Variable. If you choose this option, you can use the standard TTClean syntax in the future whenever you run TTClean. The following procedure assumes that you created a folder named TTClean at the root level of the installation drive. See the preceding section. Perform the following procedure only if you install TTClean on a non-TT machine. The System Properties dialog box displays. Scroll through the System Variables list box to locate Path, click it, and then click Edit. Click to place your cursor at the beginning of the text in the Value box. You must end this value with a semi-colon (;). To save this path and close the Edit System Variable prompt box, click OK.
To save your changes and close the Environment Variables dialog box, click OK.
To close the System Properties dialog box, click OK. The following section sets TTChron to run TTClean at 10:15 PM everyday (Monday through Sunday) using the command line option -V.
TTClean references ttclean.ini (located in <root drive>:ttconfig) whenever it runs. You must configure this file with all of the actions you want TTClean to perform. Commented-out sets of commands specific to the TT MISS Gateways. To enable the commands specific to the TT MISS Gateways, you must uncomment the appropriate line(s) of text by removing the # sign at the beginning of the particular line. Before activating any lines in ttclean.ini (uncommenting them), TT recommends that you determine what the line is set to do. Commands in ttclean.ini are not sensitive to case. When you want TTClean to purge (i.e., delete) files from your machine on a regular basis, add a purge command line to the ttclean.ini file. However, because of potential disasters, TTClean does not perform the purge function on any root drive directory. Sets the number of most recent files of the specified Filename that TTClean keeps. TTClean purges all older files. For example, to retain the last five files of a particular type and delete all older files, set NumFilesToKeep to 5. Sets the directory that TTClean scans for files to delete. Sets the filename of the file you want TTClean to delete. You can use wild cards when specifying filenames. For example, to purge all files that end in .log, use *.log. Optional. Sets TTClean to purge recursively. All subdirectories of the directory you specified (in Directory) are also searched for files to delete. For example, if you set directory to E:tt and include subdir, TTClean purges files from the tt folder as well as all of its sub-directories (e.g., bin, config, datfiles, etc.). This entry configures TTClean to retain the five (5) most recent files of any type (*. *) in the directory e:ttauditfiles. This entry configures TTClean to retain the five (5) most recent log files (*.log) in the directory e:ttlogfiles and any subdirectories (subdir). When you want TTClean to rename and move files on your machine on a regular basis, add a rename command line to the ttclean.ini file. A useful technique for the rename function is to rename and move all old log files into an archive directory for backup purposes. Sets the acceptable age of files in days. 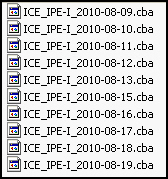 TTClean renames all files older than this age. 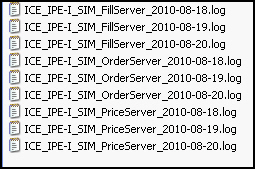 For example, to rename all files older than five days, set Days to 5. Sets the absolute directory path and filename of the file(s) that you want to rename. You can use wildcards (i.e., *) to specify multiple filenames. 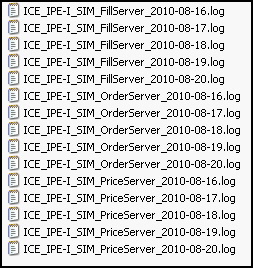 For example, to rename all files in E:ttlogfiles that end in .log, type: E:ttlogfiles*.log. The absolute directory path where you want to move the file(s). The filename must include the symbol @ before the file's extension. TTClean does not create new folders, so you must enter an absolute directory that consists of preexisting folders. You must include an @ sign to merge the date to the filename. The date consists of the two-digit month, two-digit day, and the last two digits of the year. For example, Guardian.log becomes GuardianDate.log. When you want TTClean to delete empty subdirectories from your machine on a regular basis, add a delete subdirectory command line to the ttclean.ini file. Due to their sensitive nature, TTClean ignores any files with an extension listed in the following table. Even if you specifically target a file that ends in an extension contained in this list, TTClean ignores the file and does nothing to it.